Grease: Live (stylized as Grease LIVE!) is a television special that was originally broadcast by Fox on January 31, 2016. It was a live, televised remake of the 1978 film Grease, executive produced by Marc Platt, directed by Thomas Kail, and starring Julianne Hough, Aaron Tveit, Vanessa Hudgens and Carlos PenaVega. Patterned on similar live television musicals that had recently been produced by NBC, the production incorporated elements and songs from both the original stage musical and the 1978 film version of Grease, as well as additional songs that were not present in either. In an effort to emulate the "energy" of a theatrical setting, live audiences were incorporated into the production's stagings. Grease: Live was broadcast from Warner Bros. Studios, utilizing two soundstages and the studio's outdoor backlot—the usage of the latter was notably affected by rain in the Los Angeles area on the day of the broadcast. Critical reception was positive, with particular praise to the overall atmosphere and production style of the presentation, as well as the performances of the cast, particularly Hudgens as Betty Rizzo—the special was dedicated in the memory of Hudgens' father, who had died from cancer one day prior to the broadcast. The special was nominated for ten Primetime Emmy Awards and won a total of five including Outstanding Special Class Program. On April 28, 2014, Fox announced that it had partnered with Paramount Television to produce a live, three-hour televised adaptation of the 1978 musical Grease in 2015. The move came in the wake of similar live musical adaptations that had been produced by NBC, such as The Sound of Music Live! and Peter Pan Live!. On January 17, 2015, Fox officially announced that Julianne Hough had been cast as Sandy and Vanessa Hudgens as Rizzo and that the special would air on January 31, 2016. Entertainment Weekly reported that the special had been delayed from its original target of Summer 2015 due to difficulties in the casting process. On May 28, 2015, it was announced that Keke Palmer would join the broadcast as Marty Maraschino, one of the Pink Ladies. On July 9, it was announced that Aaron Tveit would star as Danny Zuko in the live TV broadcast, and Carlos PenaVega would play the role of Kenickie. On September 30, 2015, it was announced that Carly Rae Jepsen, Kether Donohue, and David Del Rio would play Frenchy, Jan, and Putzie, respectively. On November 6, it was announced that Jordan Fisher, Andrew Call and Yvette Gonzalez-Nacer would join the cast as Doody, Sonny and Cha-Cha, respectively. Director Thomas Kail envisioned Grease: Live as being a "combination" of elements from the original musical and the 1978 film version of Grease. For instance, the production incorporated songs that were created for the film version, such as a performance of its theme song "Grease (Is The Word)" by Jessie J, "You're the One That I Want", and "Hopelessly Devoted to You", as well as songs that were exclusive to the stage version, such as "Freddy, My Love" and "Those Magic Changes". Kail explained that "very early on as I started imagining what this could be, talking to Marc Platt, our executive producer, and the folks at Paramount, one of the things we really were very focused on was trying to capture the spirit of both the original companies of Grease and that film that has left such an indelible impression on all of us. To try to honor that and pay homage to something that has moved us and we have such a great affection for, and then try to make our own version of it." The production also contained several new songs including the original, "All I Need Is an Angel", which was written for the character of Frenchy (Carly Rae Jepsen) by Tom Kitt and Brian Yorkey of Next to Normal fame. Joe Jonas's band DNCE made a cameo appearance as Johnny Casino and The Gamblers during the Rydell High dance where they performed The Crickets' "Maybe Baby", as well as a 1950s-inspired remix of their own debut single "Cake by the Ocean" in addition to "Born to Hand Jive" from the stage version and "Rock and Roll Is Here to Stay" which was previously only part of the film version. In an interview with Rolling Stone, Jonas explained that the band was approached by the producers for the role following a concert they had performed in New York City. Grease: Live was broadcast from Warner Bros. in Burbank, California, using two soundstages, half of its backlot, and 44 cameras. Set designer David Korins explained that the medium of a live, television musical would "really show off what theater does best, and also what film and television does best", having constructed a self-contained "cafegymatorium" set that is designed to provide an "immersive", 360-degree experience, as well as traditional theatrical-style stagings. Grease: Live was presented to live studio audiences at each of the three filming locations, who were also directly integrated into relevant scenes as extras on-stage, such as in crowds. Kail explained that he wanted to capture the "feeling" of the audiences at live stage productions, as there was "an energy and an undeniable vitality that real humans give back to real humans that are performing". 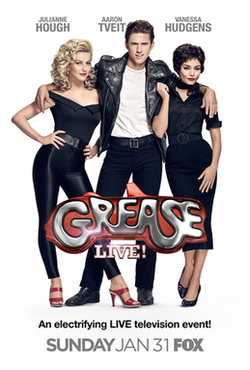 The Hollywood Reporter believed that the use of live audiences would help to stylistically distinguish Grease: Live from the NBC live musicals that it was patterned after. The price of a 30-second commercial during Grease: Live was set between $300,000 and $320,000. Coca-Cola was signed on as a major sponsor of the special; the sponsorship included product placement of classic Coca-Cola signage and beverages within the special (such as on a vending machine and on the diner set), and sponsored social media content. In order to be appropriate for broadcast television and to appease advertisers, several songs were edited for content; Platt stated that his goal was to make Grease: Live a "family-friendly" show, but still wanted to maintain "the appropriate edge" the musical required. Among the edits, "Greased Lightnin'" changed the lyrics to remove several profane and sexual words (edits that original songwriter Jim Jacobs had made to the officially licensed versions many years prior), while the Italian profanity "fongool" was replaced with "be cool" within "Look At Me, I'm Sandra Dee". The use of outdoor sets for portions of the production led to concerns that it could be affected by weather, especially in the wake of forecasts calling for a 100% chance of precipitation and possible thunderstorms on the day of the telecast. Kail stated that the production did have contingency plans in the event of rain, while Platt stated that his team had factored the possibility of rain into its plans for "many months", and that while safety was the highest priority, the show would still go on, rain or shine. While prepared for the possibility of rain, wind was also a major factor: at around 3:00 p.m. PT, an hour before the telecast went live, Platt was informed that a particular structure on the outdoor set could not be used for safety reasons. By 3:40 p.m. PT, while the team was in the process of re-staging the opening number to exclude the structure, the rain and wind passed, and engineers cleared the use of the structure—allowing a return to the original staging. The broadcast would ultimately feature references to the conditions: emcee Mario Lopez jokingly introduced "El Niño" as being a "special guest", while the opening number, "Grease (Is the Word)", was performed with the cast holding umbrellas, and during a discussion about having a live broadcast at Rydell High, Principal McGee (Ana Gasteyer) quipped, "Let's just hope it doesn't rain." On the day of the broadcast, Vanessa Hudgens announced on Twitter that her father, Greg, had died of cancer the night before, and that she would dedicate her performance in Grease: Live to his memory. Platt told Entertainment Weekly that he was "fiercely proud" of Hudgens' handling of the situation, describing her as a "very determined young woman" who "knows that the show has to go on, as any actor of the theater or in a live event knows. So she decided she would take her feelings of loss and sadness and put them in a box for that afternoon, that she would use them to fuel her performance and she would do it in honor of her father." Additionally, Fox and Paramount allowed the production to be dedicated in memory of Greg; Platt went on to say that "the cast was behind her and we all joined hands and said, 'We're going to live in this moment. Sometimes life interferes. But you have all worked so hard for this moment and we're going to go for it.'" The official soundtrack album, Grease: Live - Music from the Television Event, was released on January 31 by Paramount Pictures. The Target edition, including four bonus tracks, was released on March 4. In the show, 23 songs were performed, but only 19 were included in the official soundtrack. "Alma Mater" (performed by Ana Gasteyer and Haneefah Wood) and "Mooning" (performed by DNCE) were not included in any version of the album. The album debuted at number 37 on the US Billboard 200, earning 13,000 album-equivalent units in its first week, with just over 9,000 coming from pure sales. It also debuted at number 1 the same week on the Top Album Sales chart. Grease: Live received mostly positive reviews. Review aggregator Rotten Tomatoes listed the special with a 91% rating based on 34 reviews, and an average rating of 8.3/10. The website's critical consensus states that "Grease: Live took the pressure and threw away conventionality — it belongs to yesterday. There was a chance that it could make it so far; we started believin' we can be who we are. Grease: Live is the word." Metacritic listed a weighted average of 74 out of 100 based on 22 critics, indicating "generally favorable reviews." Megan Vick of TV Guide felt that Kail had "upped the standard" for live television musicals, and had "successfully managed to combine all the nostalgic elements of Grease that everyone expected while creating a new experience. The set changes and scale of what they were able to accomplish—in a rainstorm no less—were incredibly impressive. Grease is the word, and ratings most likely will be too." While praising "All I Need Is an Angel" for demonstrating Carly Rae Jepsen's capabilities as a singer, Vick felt that the song was too modern for a musical that is set in the 1950s. Jeremmy Gerald of Deadline Hollywood noted that Grease: Live was broadcast "with nary a hitch and one last-minute change in the out-of-doors opening number that paid tribute to the greatest movie musical of all time, Singin' in the Rain". Acknowledging that none of NBC's live musicals had "hit the stratospheric highs of this show", aspects of the production were praised, such as the live audiences and stage design. Vanessa Hudgens was judged to have "stolen" the show, and that Aaron Tveit and Julianne Hough "couldn't be better matched as the head of the T Birds and the sweet new girl from Utah." In conclusion, Gerald felt that he had "never seen a more inventive interplay between a show and just enough of the mechanics of the deal to make it all the more engaging. That, and the audience that played its essential part in moving Grease Live along with enthusiastic applause replacing the dead air that followed key moments in the earlier live broadcasts, set a new standard for this kind of presentation that will be tough to top." Variety's Maureen Ryan felt that the performance of Hough and Tveit was weak, explaining that "when Danny has all the presence of a glass of milk and even the black-clad Sandy of the final scenes exudes all the sexual danger of a church choir director, well, rest assured that those concerned about the Grease legacies of Travolta and Olivia Newton-John have nothing to worry about." Despite this and other shortcomings, such as audio issues during "Hopelessly Devoted to You", and the "surreality" of the audience's presence in certain scenes, Ryan felt Grease: Live got "most of the big things right", and that "by incorporating a live audience, using creative staging and employing energetic camera work", the production "boasted an impressive sense of momentum and even spontaneity." Of the individual performances, Ryan praised Keke Palmer's, Hudgens', and Carly Rae Jepsen's vocal performances, Elle McLemore's "simply terrific" Patty, Kether Donahue's "infectious joy", and Ana Gasteyer's "beautifully droll timing" as Principal McGee. She concluded that "If Fox can get the lead casting right in future and snag Kail again, audiences will surely be hopelessly devoted to the network’s next live endeavor." Writing in USA Today, Robert Bianco noted various positive and negative aspects of the broadcast. While he praised performances by the supporting cast, he lamented "the progressive dumbing-down of the material. A Broadway musical that originally spoofed our rose-tinted-glasses view of the '50s has turned into a nostalgic wallow, leaving the show with an odd mix of tones – and in this particular version, a book that sometimes seemed to get lost between songs and inside jokes. ... it was often so flatly acted" that the "kinetic", "visually impressive" musical numbers came as a "much-needed relief". Nevertheless, he felt that the production "sprang to life at the end." Grease: Live was seen by 12.18 million viewers, with a 4.3/13 share in the 18–49 demographic, making it the most-watched program of the night. The special brought Fox its best ratings of the 2015–16 television season since the second season premiere of Empire in September 2015, which was seen by 16.18 million viewers. The overall and demographic ratings also beat NBC's December 2015 presentation of The Wiz Live!, with 6% higher viewership overall, and 30% higher 18-49 ratings. While both competed against NFL games, The Wiz competed against a regular-season Thursday Night Football game on CBS, and Grease against the Pro Bowl on ESPN. Over 1.2 million Twitter posts were made throughout the airing, with most providing condolences for Hudgens' father. An encore of Grease: Live on March 27, 2016, Easter Sunday, was seen by 1.54 million viewers. TiVo Inc. estimated that Hudgens' solo of "There Are Worse Things I Could Do" was the most replayed scene of the special. In Canada, Grease: Live was aired by CTV, in simulcast with the Fox broadcast. The special aired on February 2 in Australia (Nine Network), February 3 in the United Kingdom (ITV2), February 5 in New Zealand (TV3), February 7 in Norway (FEM), February 20 in Denmark (TV2 Fri), and in Italy March 3 (subtitled), August 21 (dubbed) (Rai 4). In Latin America, it was broadcast by FOX Family on April 24, 2016. It was broadcast in Sweden by the public service network (SVT1) on June 12, 2016. It was broadcast in The Netherlands by RTL 8 on July 22, 2016. In Singapore, it was broadcast on Mediacorp Channel 5 on Christmas night, December 25, 2016. In France, it was broadcast on 6ter on December 26, 2016. Grease: Live was released on DVD and Digital HD, on March 8, 2016. It was included in the 40th anniversary collection Blu-ray alongside Grease and Grease 2, which was released on April 24, 2018. ^ Tuttle, Brad (February 1, 2016). "Here's How Much Money It Cost to Produce 'Grease Live' on Fox". Times. Retrieved October 31, 2016. ^ a b Keveney, Bill (April 28, 2014). "Fox to go live with 'Grease'". USA Today. Retrieved February 1, 2016. ^ a b c d Kreps, Daniel (January 17, 2015). "Fox Plans 'Grease' Live Musical With Julianne Hough and Vanessa Hudgens". Rolling Stone. Retrieved February 1, 2016. ^ a b Hetrick, Adam; Viagas, Robert; Gioia, Michael (May 28, 2015). "Keke Palmer Joins Cast of Fox's Grease: Live!". Playbill.com. Retrieved April 20, 2018. ^ a b c Hibberd, James (July 9, 2015). "Fox's Grease: Live casts Graceland star as Danny Zuko". Entertainment Weekly. Retrieved August 16, 2015. ^ a b c Gans, Andrew (September 30, 2015). "Broadway's Cinderella and "Glee" Choreographer Join Fox's Grease: Live". Playbill. ^ a b c d Viagas, Andrew; Clement, Olivia (November 6, 2015). "Fox's Grease: Live Gets Its Doody, Sonny and Cha-Cha". Playbill.com. ^ Rooney, David (January 25, 2016). "'Hamilton's' Thomas Kail Makes the Leap to TV for "Bold" Take on 'Grease: Live'". The Hollywood Reporter. Lynne Segall. Retrieved February 3, 2016. What we're doing here is taking the spine of the film and then also having access to parts of the stage play. ^ a b Gomez, Patrick (January 31, 2016). "Freddy, My Love? The Grease: Live Songs You May Not Recognize". People. Retrieved February 1, 2016. ^ a b Rooney, David (December 17, 2015). "Fox's 'Grease: Live' to Incorporate Studio Audience". The Hollywood Reporter. Retrieved January 31, 2016. ^ Spanos, Brittany (January 27, 2016). "Joe Jonas Talks DNCE's 'Grease: Live' Cameo". Rolling Stone. Retrieved February 1, 2016. ^ a b Lynch, Jason (January 29, 2016). "Fox Finds the Perfect Sponsor for Its 1950s-Era Grease Revival: Coca-Cola". Adweek. Retrieved February 12, 2016. ^ Steinberg, Brian (January 29, 2016). "Coca-Cola Hopes To Cut Through Fox's Live 'Grease' With Ad Play". Variety. Retrieved February 12, 2016. ^ Robinson, Joanna (January 31, 2016). "Why Grease: Live Had to Censor Some of Its Most Famous Lyrics". Vanity Fair. Conde Nast. Retrieved February 12, 2016. ^ a b c d Snetiker, Marc (February 1, 2016). "Grease: Live producer on alternate opening, dedication to Vanessa Hudgens' father". Entertainment Weekly. Retrieved February 2, 2016. ^ Stanhope, Kate (January 29, 2016). "'Grease: Live' EP on Sunday Rain Forecast: "We're Fully Prepared"". The Hollywood Reporter. Retrieved February 1, 2016. ^ Gomez, Patrick (January 31, 2016). "How Grease: Live plans to handle wet L.A. weather". Entertainment Weekly. Retrieved January 31, 2016. ^ a b Gerard, Jeremy (January 31, 2016). "With Spectacular 'Grease Live', Fox & Paramount Raise Bar On Live TV Presentations – Review". Deadline Hollywood. Retrieved February 1, 2016. ^ Birnbaum, Debra (January 31, 2016). "'Grease Live': Inside the Final Dress Rehearsal". Variety. Retrieved September 14, 2016. ^ Saad, Nardine (February 1, 2016). "Vanessa Hudgens dedicates 'Grease: Live' to her father, who died a day before the show". Los Angeles Times. Retrieved February 2, 2016. ^ Gioia, Michael (January 31, 2016). "Grease: Live Star's Father Passes Away, But She Says, "I Do The Show In His Honor"". Playbill. Retrieved November 26, 2018. ^ a b Bentley, Jean (September 30, 2015). "Meet the New Pink Ladies: Grease: Live Cast Keeps Getting Even More Amazing With Carly Rae Jepsen!". E! News. Retrieved November 26, 2018. ^ a b Gioia, Michael (January 18, 2016). "Carly Rae Jepsen Will Get New Song in Grease: Live; Original Film Stars to Cameo". Playbill. Retrieved November 26, 2018. ^ a b c d Viagas, Robert (January 6, 2016). "Boyz II Men Will Earn Their Wings on Grease: Live Broadcast". Playbill. Retrieved November 26, 2018. ^ Bryan, Jacob (January 13, 2016). "TV News Roundup: Joe Jonas' Band Appearing On 'Grease: Live' & More". Variety. Retrieved November 26, 2018. ^ Clement, Olivia (October 9, 2015). "Heathers and Bring It On Star Elle McLemore Joins Grease: Live". Playbill. ^ "Broadway Vet Wendell Pierce Joins Cast of GREASE: LIVE!". Broadway World. January 26, 2016. Retrieved December 3, 2017. ^ "Former Neighbours star hits the stage". TV Week. February 2, 2016. Archived from the original on April 20, 2018. Retrieved February 25, 2017. ^ Swift, Andy (June 28, 2016). "Younger Taps Grease: Live Alum to Play Awkward Millionaire in Season 3". TVLine. Retrieved April 20, 2018. ^ Gilbert, Ryan (August 22, 2017). "Dancing Through Life! Grease: Live! 's Jon Robert Hall Joins the Wicked Tour as Fiyero". Broadway.com. Retrieved April 20, 2018. ^ "Grease Live! (Music From The Television Event)". iTunes. January 29, 2016. Retrieved January 9, 2016. ^ "Watch All the 'Grease: Live!' Performances Here". Billboard. January 29, 2016. Retrieved January 9, 2016. ^ a b "GREASE! Live on Fox (Target Exclusive)". Billboard. January 29, 2016. Retrieved January 9, 2016. ^ "'Grease Live' By the Numbers". Variety Magazine. January 29, 2016. Retrieved January 9, 2016. ^ "Get ready to break out the hand jive: The Grease: Live soundtrack will drop on Jan. 31". Entertainment. January 29, 2016. Retrieved January 9, 2016. ^ a b "Billboard 200: February 20, 2016". Billboard. January 29, 2016. Retrieved January 9, 2016. ^ Caulfield, Keith. "Billboard 200 Chart Moves: 'Grease Live' & 'Grease' Movie Soundtracks 'Go Together' Up the Chart". Billboard. Retrieved December 10, 2016. ^ "Billboard Top Soundtrack". Billboard. Retrieved December 10, 2016. ^ Ryan, Gavin (February 13, 2016). "ARIA Albums: Molly Is No 1". Noise11. Retrieved February 13, 2016. ^ "Billboard Top Soundtrack: February 20, 2016". Billboard. January 29, 2016. Retrieved January 9, 2016. ^ "Grease: Live! (2016)". Rotten Tomatoes. Fandango Media. Retrieved March 7, 2018. ^ "Grease: Live Reviews". Metacritic. CBS Interactive. Retrieved March 7, 2018. ^ Vick, Megan (February 1, 2016). "Grease: Live! Hits and Misses: From "Freddy, My Love" to the Thunder Road Race". TV Guide. Retrieved November 26, 2018. ^ Ryan, Maureen. "TV Review: 'Grease Live!'". Variety. Retrieved February 1, 2016. ^ Bianco, Robert (January 31, 2016). "Review: Visually impressive 'Grease: Live!' still slips". USA Today. Retrieved November 26, 2018. ^ "'Grease Live' Demo Ratings Close In On 'Sound Of Music Live!' – Update". Deadline Hollywood. Retrieved February 1, 2016. ^ "FOX to Air Special 'Tweet Along' Encore of GREASE: LIVE This Sunday". broadwayworld.com. Retrieved March 26, 2016. ^ Rick Porter. "Sunday final ratings: '60 Minutes' adjusts up, everything else holds". TV by the Numbers. Retrieved March 30, 2016. ^ "Vanessa Hudgens' Heartbreaking Solo Leads 10 Most Re-Watched 'Grease: Live' Moments". TheWrap. Retrieved February 2, 2016. ^ Ehrbar, Ned (May 7, 2017). "MTV Movie & TV Awards 2017: Complete list of winners". CBS News. Retrieved April 20, 2018. ^ Yeo, Debra (January 31, 2016). "TV Tonight, Jan. 31: Grease is the show, live". Toronto Star. Retrieved February 2, 2016. ^ Pobjie, Bob (February 1, 2016). "What's on TV Tuesday: Grease: Live". Sydney Morning Herald. Retrieved February 2, 2016. ^ "ITV2 to air Paramount Television's star-studded Production GREASE: LIVE" (Press release). ITV. January 27, 2016. Retrieved November 26, 2018. ^ Baraclough, Leo (January 27, 2016). "Paramount Musical 'Grease: Live' to Air on U.K. Broadcaster ITV". Variety. Retrieved December 3, 2017. ^ "GREASE:LIVE Is Coming To Our Screens". www.tv3.co.nz. February 3, 2016. Archived from the original on August 11, 2016. Retrieved December 3, 2017. ^ "Grease Live!" (in Danish). Archived from the original on February 18, 2017. Retrieved February 20, 2016. ^ "Rai 4: Il Musical Grease Live!". www.ufficiostampa. rai.it (in Italian). Retrieved February 12, 2016. ^ "Grease Live! bij RTL 8" (in Dutch). July 18, 2016. Retrieved December 3, 2017. ^ "Grease : Live ! - VF - Diffusé le 26/12/16 à 20h55 sur 6TER" (in French). Le Figaro. Retrieved April 5, 2017. ^ "GREASE LIVE! Now Available on Digital HD; Coming to DVD 3/8!". Broadway World. February 3, 2016. Retrieved April 5, 2017. ^ Arnold, Thomas K. (February 2, 2018). "Paramount Preps 40th Anniversary Edition of 'Grease'". Media Play News. Retrieved November 26, 2018.